Longevity’s Philosophy - Why the Turtle? Longevity’s logo came about from a Japanese folk legend telling of a young fisherman whose assistance to a turtle was rewarded with 300 years of life. The turtle symbolizes longevity, prosperity, in addition to stability and balance of energies. The turtle teaches us to seek out new experiences and opportunities, and to not become attached to any one place, but to survive any circumstances (self-sufficiency). In a shell, the turtle protects our lives by teaching us to protect ourselves. At Longevity MedSpa, our Age Management routine teaches our patients how to protect themselves, to live healthier, productive, and beautiful lives. You will receive the knowledge to know how to combat the four main reasons for aging and poor health, glycation, methylation, oxidation, and inflammation. We will address the internal and the external reasons of aging, and put you on the correct path to health and longevity! Gretta Graceland, MAc, LAc, RDH, CNT, FDN started her medical career as a dental hygienist in 1987. By 2000 she had found the career love of her life, acupuncture. Not just needles, but the whole body wellness idea. By nourishing the body with healthy foods, nutraceuticals, exercise, and a great skincare regimen, she has found herself looking and feeling great. "Nobody believes I am as old as I am, it feels.... Beautiful!!". Gretta's skincare interest started before acupuncture school when she noticed her skin was looking dull and lifeless. Her search for a perfect, effective, and the most natural products began. During and after acupuncture school, she tested a theory about using acupuncture with skin rejuvenation. The results were unbelievable, she found that her patients reacted to their facial treatments quicker and more effectively using acupuncture along with their skincare regimen. "I love seeing my patients so thrilled and satisfied with the results. These patients have tried other products and other doctors and haven't had the success." By 2005, Gretta opened Longevity MedSpa. Since then she has seen and made a difference for many more patients. 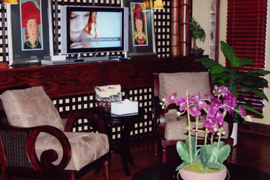 "I always use acupuncture with any skincare procedure. It just wouldn't be right not to."